Your brand is much larger than any visual identity, voice or style guide. Ultimately, it’s defined by what those on the outside say or how they feel – and that’s a result of experiences inside and out of your product. Designer Everett Katigbak has spent his career building and shaping those experiences for some of the largest names in tech. Today Everett’s focused on bringing Stripe’s brand to life through film, print and interactive experiences. He was previously Pinterest’s brand manager, following a lengthy stint as a member of Facebook’s original brand design team. There, he co-founded the Analog Research Lab, a print studio inside Facebook headquarters, which had a massive and lasting impact shaping and spreading the company’s culture. Everett joined me on our podcast to explain how brand design supports product, the value of analog skill sets, how design can spread culture, and more. If you like what you hear, check out more episodes of our podcast. You can subscribe on iTunes or grab the RSS feed. Brand or communications design is about taking the emotion your product elicits and making it canonical so that it connects with someone at a personal, human level. Writing is a core tool for any designer. If you can conjure an image in someone’s mind without visuals, your design work becomes inherently stronger. Brand design initiatives, like the Facebook Analog Research Lab, present internal communications opportunities that can help humanize technical and complex work. All people in product company can stretch their thinking by adding skills outside their comfort zone, e.g. an engineer building analog objects or a designer learning to code. Having a collective design team (product and brand) in your startup’s early days helps build a collective conscience; however, they’ll need to scale independently as they begin to solve different problems. Stewart Scott-Curran: Everett, thanks for joining us today. To get started, how did you get into tech and brand design? Everett Katigbak: I came here from the museum and exhibition design world. For the most part, I was doing a lot of physical and environmental design. Honestly, tech was the furthest thing from my brain. I loved the museum. It was a super fun and fulfilling experience. I knew I wanted to live in the Bay Area. Living in LA, I had gotten sick of sitting in the car and breathing all the smog. On top of that, I just wanted to see what else was out there outside of the museum. Which can get pretty repetitive, although each subject and each exhibition you do is pretty interesting. You start to fall into patterns, and doing the an exhibit is pretty straightforward. I started talking with as many people as I could up here – I was talking to Facebook and I talked to some friends at Google. There was something different about the people that I met at Facebook and I ended up getting an offer there. I didn’t really quite know what to expect back then. Now I’m at Stripe. I’ve been there for just under a year. The company is growing pretty rapidly. It’s been reinventing itself in the short time I’ve been there, which has been pretty exciting. Before Stripe I was at a smaller startup called Shyp, trying to help them figure out their brand storytelling. Before that I was at Pinterest for quite a while. I was there when it was a really small company all the way up until it was a medium-to-large sized company. Stewart: You focus on communications design and brand design as opposed to product design. That label has been around for a while, but in terms of applying that to business problems, especially in tech, it feels like it’s a fairly new thing. What does that label, communications design, mean to you? Everett: I’ve always been more inclined to help with the narrative side of a company. A lot of the brand is experienced through the product, so people start to intuitively understand what the brand means. But at a certain point you need to start being more proactive and start shaping what that narrative is. For me, a lot of it is taking that feeling that you’re trying to elicit through this thing you’re building and just making it more canonical. A lot of the brand is experienced through the product. A friend of mine broke it down pretty saliently when he said, “Product is about making something that’s relatively universal to a broader set of people.” You want to solve problems at scale. Brand and marketing is about taking that emotion or that feeling and then making it canonical – trying to make it really connect with someone at human level, which often is very specific and very personal. It’s not really one or the other; they all flow together pretty naturally, at least in the early days of these companies that I’ve been at, because there’s a lot more access to the product team and the original or the early product development cycle. Stewart: You see a lot of blog posts that say that your brand is more than a logo or visual identity. What do you see as the core components of a brand today? How do you go a little bit deeper than that? Everett: This is the age-old challenge for a designer, and it’s constantly evolving, especially with new tools and new distribution channels for brands to get their message out there. Take the traditional identity of design, which used to be more what designers specifically thought of as brand, like, “I’ll make you a logo and I’ll do these brand identity guidelines.” That’s about visual consistency, or even voice to a certain degree. There are a number of ways that people talk about brand. People say, “It’s a promise that your product or your company is building,” or it’s really about this deeper thing that you stand for as a company. The logo itself really is just a trigger. It’s meant to remind people of these experiences and these narratives and all of these things that you’re investing in as a company, these deeper things that you stand for today. It’s meant to remind them of who you are and what you stand for and why they want to be loyal or support you as a business. Stewart: At Stripe you’re doing a lot more than just logo and color. You’re working on bringing the brand voice to life through film, print, and interactive experiences. What are some of those things that you’re doing to diversify the brand voice, and how does that play into Stripe’s mission? Everett: Much of what I like to do is narrative-driven. Even though I have a background and a training in visual design and communication design, I tend to think more about voice and story. I approach all of my projects and all the challenges that accompany them with that in mind, and then I have to figure out the right story we’re trying to tell. Essentially, it’s a strategic way to think about things. Then, once we start to figure out what that narrative is, I think about the appropriate medium depending on what our goals are. Video’s often the way that I like to approach things because I’m really interested in filmmaking. At the same time, sometimes it’s interactive experiences, sometimes it’s environmental design through events and things like that. I’ve done a fair amount of all those things, and my personal interest never starts with one specific medium. It’s really about diving into a story and then finding all these cool ways to get people to experience those. Stewart: Thinking about story and narrative, I know you write a lot as well. How does writing help with your design work and vice versa? Microsoft Word is the most powerful design tool you could have. I really took that to heart. For me, all of my ideas and all of my stories start with free writing. I wake up every day, and I block it off on my calendar and will write for at least 30 minutes about anything just to keep those skills sharp. All the work that I do is about storytelling, but it’s also just conjuring up an image in someone’s mind. Writing is a way to do that without the visual side of things, so if you can really shape that, it will just make your visual work a lot stronger. Stewart: You were one of the original brand team members at Facebook. What was the state of Facebook’s brand then you arrived, and how important should brand be to founders in a startup, especially the early days? Everett: Facebook was a really interesting company, and it still has a lot of the things that made it awesome, but also made it a crazy place. A lot of Facebook’s brand really was tied to Mark Zuckerberg himself and these legends and stories that now are immortalized in movies like The Social Network. People couldn’t really separate Mark Zuckerberg – this young, radical CEO – from Facebook’s product and the experience, which was to build a useful communication tool that helps people connect with their families and friends and talk about our interests. From left: Mark Zuckerberg, Frank Gehry and Everett Katigback review environmental design at Facebook. Anytime they would do something product-wise, people would essentially blame Mark. He had a lot of baggage in people’s minds. It took a lot of work for them to decouple him from the product itself. As those two brands, Mark Zuckerberg’s brand and the Facebook brand, became their own independent things, now you can see how Mark’s brand has developed. He’s starting to grow into his own as a legitimate world leader. He’s a voice that a lot of people really look to. Then the product itself is able to exist without him having to do a lot of the heavy lifting. There are a lot of examples today. Look at Uber. A very similar experience, where people can’t decouple the product from Travis Kalanick, the CEO. Whenever Uber does something, they’re very quick to blame him, because he doesn’t really have the trust of the people. Stewart: As designers at Facebook in the early days you did a lot to help shape and communicate the culture there. You were one of the founding members of Facebook’s Analog Research Lab, which is a great example. 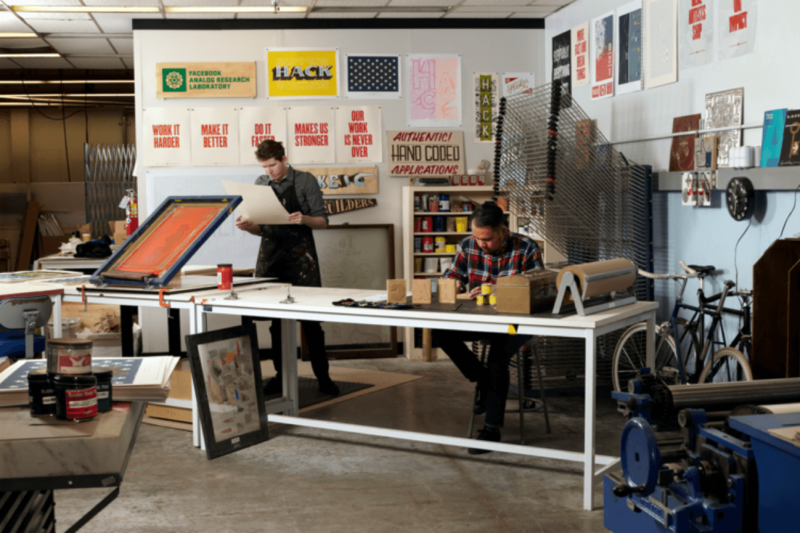 Why build a print shop inside a tech company? Everett: When we were trying to conceive this idea, it wasn’t necessarily like, “Let’s build a print shop inside of this digital tech company.” Ben Barry (co-founder) and I were honestly just reverting to things we knew how to do as designers. I had come from LA where I was doing exhibition design. Ben came from Austin and he was actually working at a screen printing shop. We were in a sea of engineers, we were in a sea of web designers, and in some ways it was a comfortable way for us to assert ourselves because these were things that people didn’t know how to do. It was really natural for us to start making stuff like that, and we just starting doing it. Ben Barry and Everett Katigbak at work in Facebook’s Analog Research Lab. Ten years ago we were these punk kids just in a punk company trying to do all this crazy stuff. It was about pushing buttons, but also getting people to see things differently. We were essentially agent provocateurs inside the company. That’s really what it was about – to get people to think differently about their jobs, the company and this thing that we’re building, which is now this mega thing that we didn’t even quite understand when we were embarking on that stuff. The Analog Research Lab was an interesting factor of the time and the conditions and both Ben and my prior experiences. It wasn’t anything that came from any top-down initiatives. It was really just us trying to find our own voice inside the company. Stewart: What were some of the first artifacts that you were getting out around there? We brought in our own tools, Ben brought in these ratty screens that he made from window frames, and that was the origin story. I brought in some saws and drills and stuff that I had in my garage, and we just started hacking away, literally, on furniture and all these things. I think back now and I see pictures from that day. It was pretty crazy, because we had access to this huge warehouse that no one knew we were in, and we stayed there all night and all weekend. We were literally screwing all these tables together and then trying to figure out how to get them to the venue. It created this amazing aesthetic that was born out of us not having money and really wanting to make something cool happen. Then from there we just kept doing it and kept making things inside the office. We started printing posters and then started sign painting and other things. Eventually I bought a letterpress and started printing things, doing linoleum blocks. It was just a different way to communicate inside the company, which was pretty wild. Stewart: You’re a strong believer that analog and digital work can not only coexist but actually help bring an aspect of humanity to technology. What are some of the ways that designers and engineers can step outside of their comfort zones and make that happen? Everett: It’s not necessarily or specifically analog stuff – I do think it’s really important, but as counterpoint to other things that exist. Being able to code and prototype things for me is super amazing, and a skill that I lack, so I try to get out of my comfort zone by perpetually trying to learn how to code and doing it very terribly. There’s something about using different tools to communicate different things. Some people are just really good, they have a really deep knowledge and skill set in one area, which I think is pretty amazing because I’m not like that. Everett gives a Creative Mornings talk about how analog and digital design can complement one another. Being able to try different things, whatever you’re trying to do, you have to get really resourceful. It gets your brain to think in a different way, which is what learning to code or even filmmaking and videos does for me. It helps me think differently (and beyond) my just go-to habits. I can very naturally pick up a pencil and draw, and when I don’t have those things I don’t have that as a crutch to rely on. It’s really important. Stewart: How do you feel the role of a communications or brand designer overlaps with what the products design folks do? That’s a place where you can often find a little bit of friction. Everett: All of the phases of a company that I’ve experienced are early enough when design is one organization. Product designers and communication designers, there really is no distinction. Sometimes they even just modulate on a per project basis. They’ll do some product design, then they’ll do a marketing site or whatever. That’s what draws me to certain companies; I like that stage of it, and I like helping build not only a design team, but building a company infrastructure, a way of working. One thing the great product designers (know) is there’s still story inside of a product. There’s this consumer experience. If you think about it that way, instead of writing a list of all the functionality and attributes of this product, or the metrics. What’s the human side of this thing? What do we want someone to do with this this thing and what do we want them to feel with it? A lot of great brands and products lead with a story and then sometimes back into an interesting product, or you’re on the cusp of making something really cool as a product and you’re asking, “Where does this fit in with someone?” At the end of the day we make stuff for people. That’s why we’re all here. Stewart: Stripe is still in the stage where there’s just one design team. It’s not broken into separate product or brand teams. Does that make collaboration and telling that one story easier? And does that become more difficult as you scale and those teams start to develop some of their own cultures and workflows? Everett: It’s really good early on when it’s just one design team because you start to develop a collective conscience as the company grows. It’s not necessarily that a team would segment or break off and do different things, but as an organization and marketing teams develop so does product. You then have other product lines, and eventually it gets into this crazy world where you have to break it down into much smaller bits so those teams can be a little bit more autonomous and do whatever they need to do. If you’re still stuck in this one small design team world, then it does start to become a little bit of a bottleneck. I do think eventually it makes sense as a brand and a business starts to gain momentum to have other types of creative thinkers and creative designers thinking about different problems. The product team will always grow and it’ll always need to be more focused on experience. Once you have bigger goals and a bigger audience from a marketing perspective, then you need people that are able to think more specifically about that. When you’re trying to modulate between too much stuff, it becomes hard to really specialize in any form of design. Stewart: Stripe’s one of the fastest growing companies in tech today. We hear a lot about the challenges of scaling the business and scaling product. What do you think is hard about scaling brand? Everett: That’s a tough one. Scaling a brand is challenging from an internal perspective because sometimes you really have to be able to let go of what you think the brand is. For the most part, a brand is what someone else experiences, not what you tell them it is. As your user base or audience starts to broaden and diversify, it becomes harder to empathize with different people from different cultures and different countries. Now that you’re able to scale internationally much more quickly than prior companies, it’s hard to do that in a quick way that is meaningful to those people. That’s one of the biggest challenges. You’re not only building this product and this brand that’s international, but you’re also building a company at a rapid pace – getting all those people to be on the same page both business-wise and cultural-wise. There’s so many moving pieces, which is what makes scaling a brand hard, because you’re simultaneously scaling a company and a way of working. Stewart: It’s a fun challenge though. Everett, thank you so much for joining us. Everett: Thanks for having me, Stewart.